The Quinnipiac Bobcats recently picked up a verbal commitment for the 2017-2018 season from Hampstead, New Hampshire native Devin Moore, a 1997 forward playing with the Brockville Braves in the Central Canada Hockey League. The 5'7 160 pound forward has had a very good rookie season with Brockville with 42 points (19 goals and 23 assists) in 49 games played. I wrote more about his commitment last week. Moore is the sixth 1997 born player to commit to the Bobcats. He is expected to bring offensive ability and speed to the Quinnipiac offense for next season. I had a chance to catch up with him as he graciously gave me some of his time for a question and answer session so Bobcat Nation can get to know one of the incoming players for the 2017-18 season. Jonathan Singer: First off let me say congratulations on your commitment and welcome to Quinnipiac. What are your emotions like right now after making this decision? Devin Moore: Thank you! I was honored to have the chance to play for such an elite program. I was beyond excited that they made an offer to me and I couldn't pass it up. It's been a dream of mine for a while now and it has become a reality. Jonathan Singer: Tell us about your recruiting process. Did you have any other Division I offers?What other schools were looking at you and did you take any recruiting visits during this process? Devin Moore: I didn't have any other offers yet but either my coach [Colin Birkas] or I had talked to about ten schools and it seemed like a few of those other schools were going to make a decision on me sometime soon. Jonathan Singer: From the press release put out by the Central Canada Hockey League it says that Quinnipiac associate head coach Joe Dumais was the one who recruited you. When did he first see you play and show interest in you as a player? Devin Moore: He [Dumais] had been talking to my coach for about a week and then gave me a call early last week expressing how interested they were in me. He came to my game this past Friday against the Pembroke Lumber Kings to see me play and that's when he made me an offer. Jonathan Singer: From there it looks like less than 12 hours later you announced your verbal commitment to Quinnipiac. Would that be accurate? Devin Moore: Yes that's true. Jonathan Singer: You played the last three seasons at Phillips Exeter Academy in New Hampshire improving each year. After graduating you decided on playing in the CCHL. What made you decide on that league as opposed to other leagues such as the BCHL, AJHL or even the NAHL? Devin Moore: I actually was visiting a Division III school and I told them I wanted to play a year of juniors so one of the assistants at that school said he was going to help find me a home. It was in early April of last year and Brockville became an option and head coach Colin Birkas sold me. I wanted to find a home early on in the spring so I could focus on getting better over the summer rather than going to multiple tryouts with other juniors teams in other leagues. I told coach [Birkas] I wanted to come play for Brockville and I'm very pleased with the decision I made. Jonathan Singer: How much have you improved in your game since coming to Brockville to play under coach Birkas? What would you say are some of your strengths? And what do you feel you have to continue to work on before coming to Quinnipiac this fall? Devin Moore: I think my game has improved immensely these last couple months with coach Birkas. He's given me the opportunity to improve my game day in and day out. I think my strengths are my work ethic, I like to play the game fast and I am definitely a smart player. I'd say the biggest thing I have to work on is getting stronger. I've always been on the small side so I'm going have to work hard this summer so I'm ready to go this fall. Jonathan Singer: Following on the last point on working out this summer to get stronger. Do you plan on coming to Quinnipiac early in the summer to work out under their strength and conditioning coach and the teams program? Devin Moore: I haven't really thought about that yet but most likely I will come to early to Quinnipiac to work out early. Jonathan Singer: Do you plan on signing your national letter of intent when the signing period opens in April? 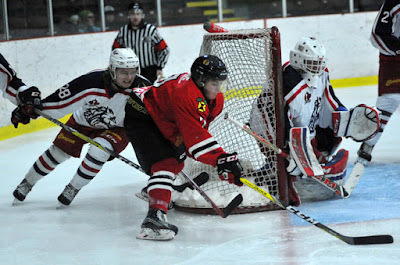 Devin Moore: Yes and I'll go visit Quinnipiac when my junior season ends with Brockville. Jonathan Singer: Will this be the first time you will have visited the Quinnipiac campus? Devin Moore: Yes it will but I have looked at it a lot online. Jonathan Singer: How would you describe yourself as a player? Would you say your more of a goal scorer or someone who is more of a play-maker? Devin Moore: I would say that I am more of a play-maker but this year I've been relied upon to score some big goals. With that being said I still think I'm a more of a play-maker. Jonathan Singer: What does the Quinnipiac coaching staff envision your role to be in the 2017-2018 season? Devin Moore: They expect me to come in and contribute by making plays and by getting on the score sheet along with having a strong team work ethic. Jonathan Singer: Quinnipiac hasn't recruited a lot out of the CCHL recently but their greatest find was another small player named Matthew Peca who played for the Pembroke Lumber Kings and had an impressive four year career at Quinnipiac before signing professionally with the Tampa Bay Lightning organization. Do you know a lot about him? Devin Moore: Yes I've heard of him before. I actually looked him up and noticed he played in his first NHL game earlier this year and tallied his first NHL goal.